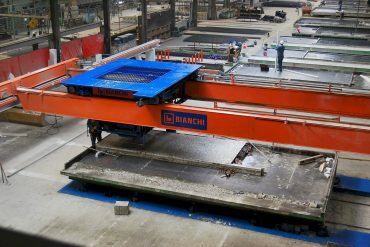 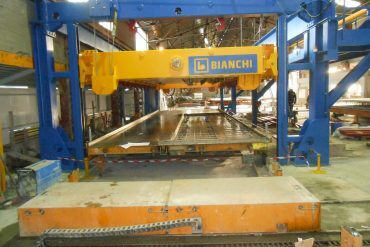 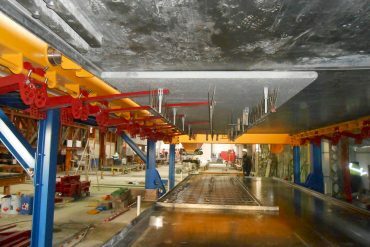 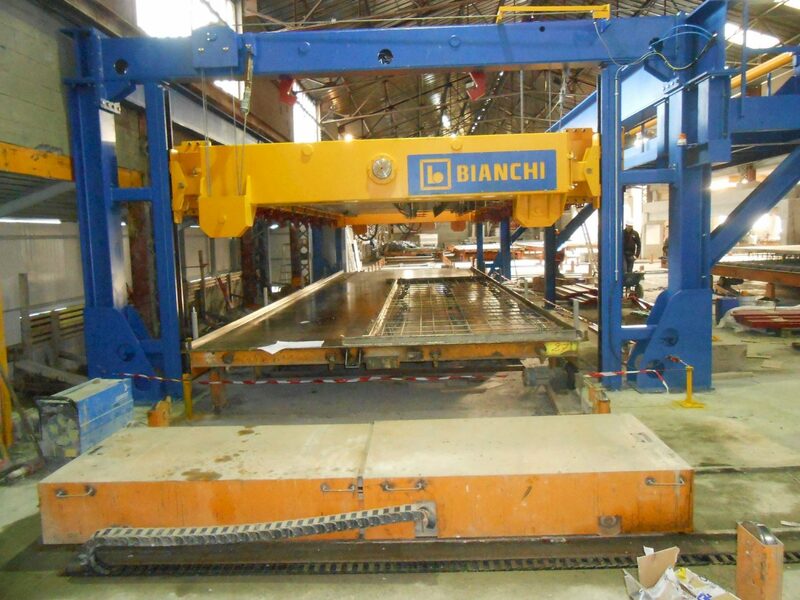 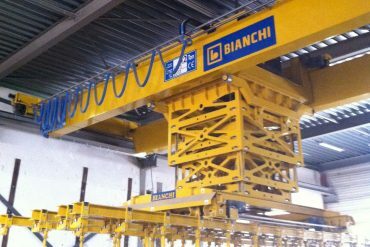 BIANCHI CASSEFORME designs, engineers and installs complete production plants for the manufacture of the most varied precast concrete panels. 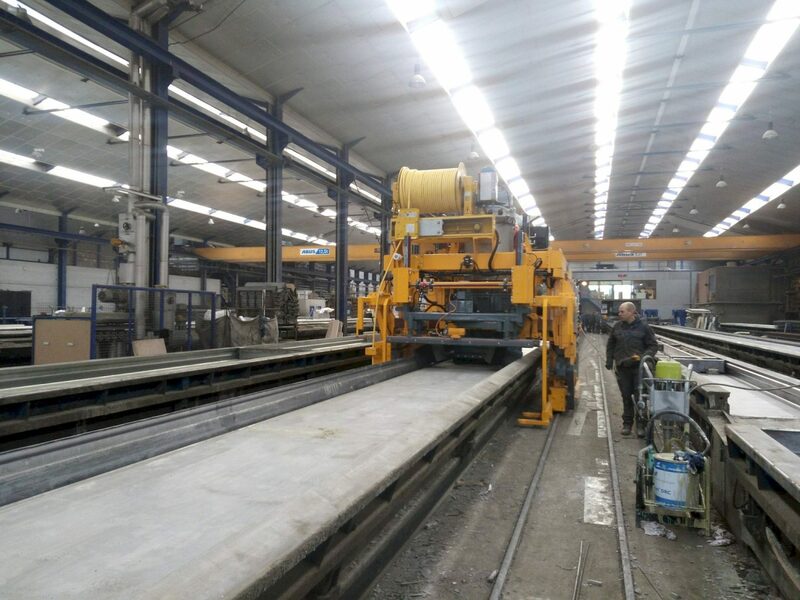 The different equipments are disposed in the production hall according to a 100% customized layout defined by our technicians in cooperation with customer. 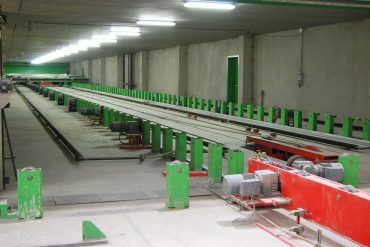 Pallet Handling Devices; Equipments that allow the movement of the pallet between the different stations of the carousel: motorised and idle wheels for the longitudinal movement, side shifters for the transversal transport, tilting station for finished product demoulding with the pallet in almost-vertical position, pallet presence switches and centering devices in order to guarantee that the pallet stop in a precise position where necessary. 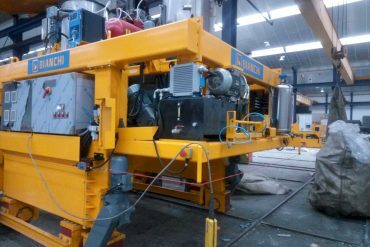 Cleaning of pallets with brushing machine (in fixed or mobile position) equipped with an exhaust fan of powder and of retardant oil. 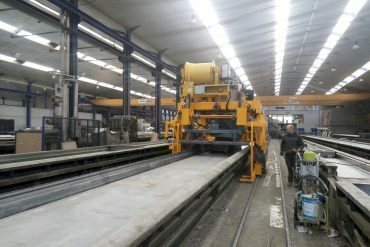 After the production cycle is completed, the pallets pass through a pallet cleaning machine. 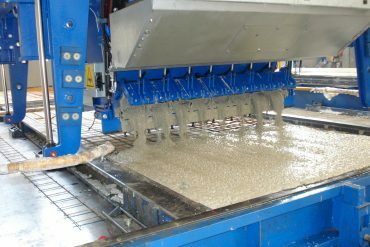 A scraper to remove fixed concrete residues is used for the rough cleaning. 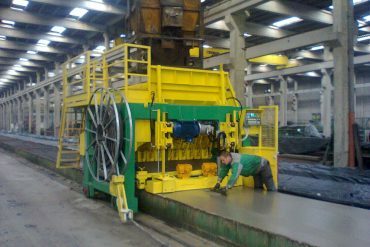 Sidewise rotating circular brushes clean the lateral edge shuttering and a roller brush is used to clean the mould surface precisely. 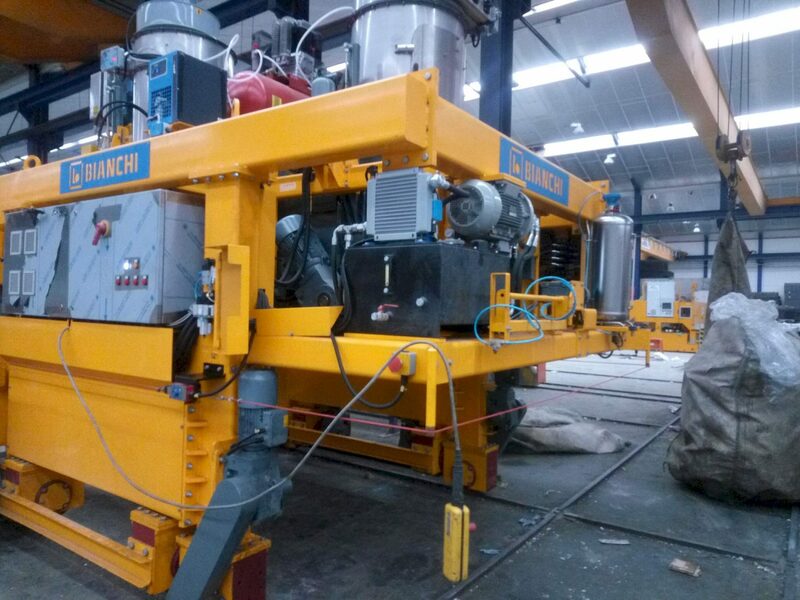 Oiling Machine. 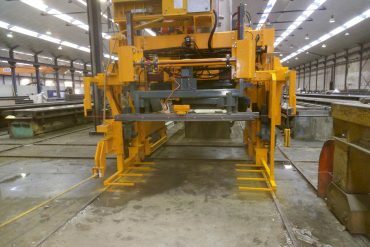 Once the pallet surfaces are cleaned, the release agent is applied to the surface of the pallet. The entire pallet surface or only the surface to be casted in concrete can be coated with a release agent. 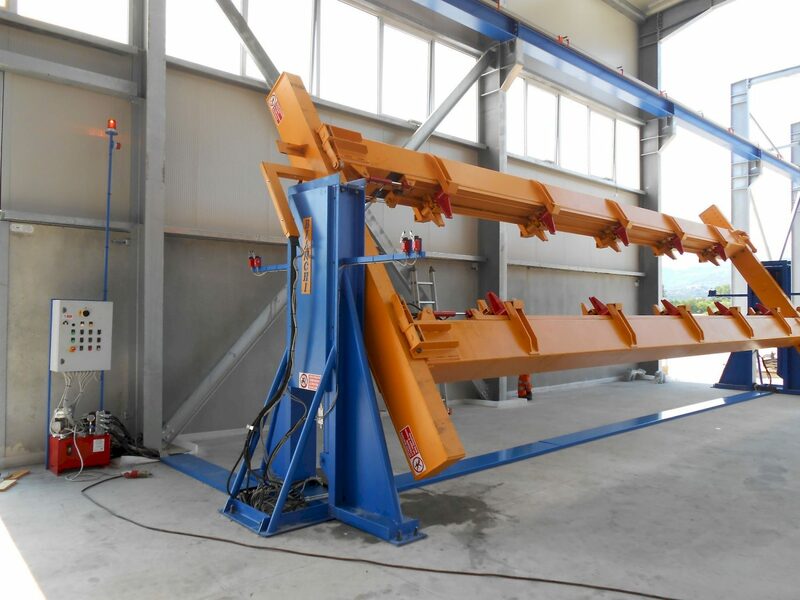 The spraying device is available in a stationary and mobile version. 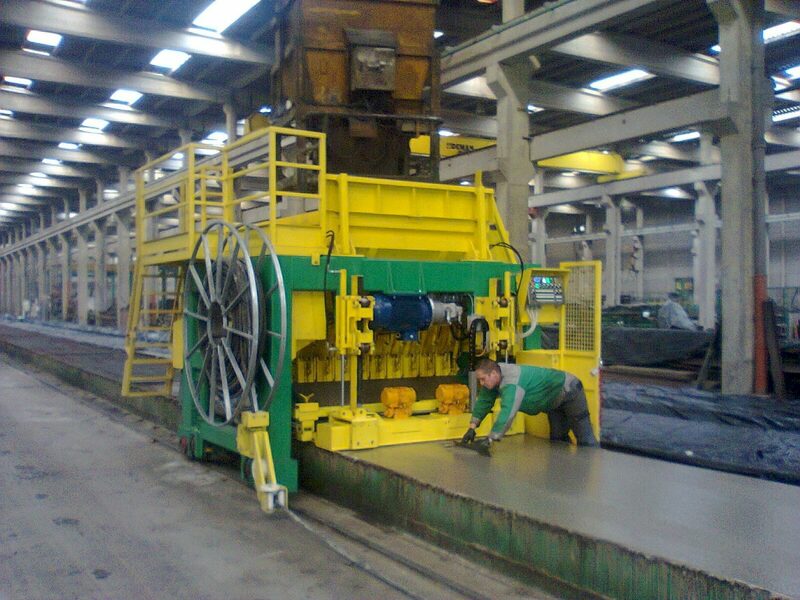 Vibrating Compacting equipment, to assure high concrete quality and exact edge and border formation. 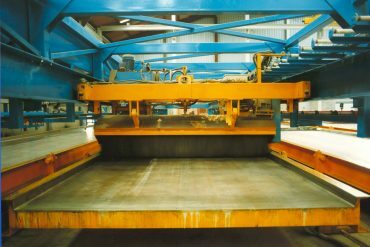 Vibration frequency can be variably adjusted to suit the various types of product. 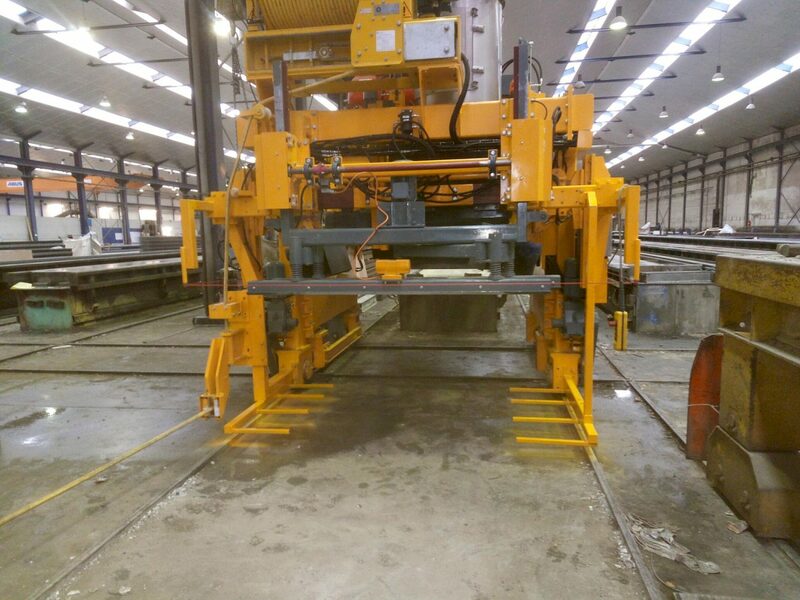 Smoothing equipment, Oscillating or vibrating levelling beam. 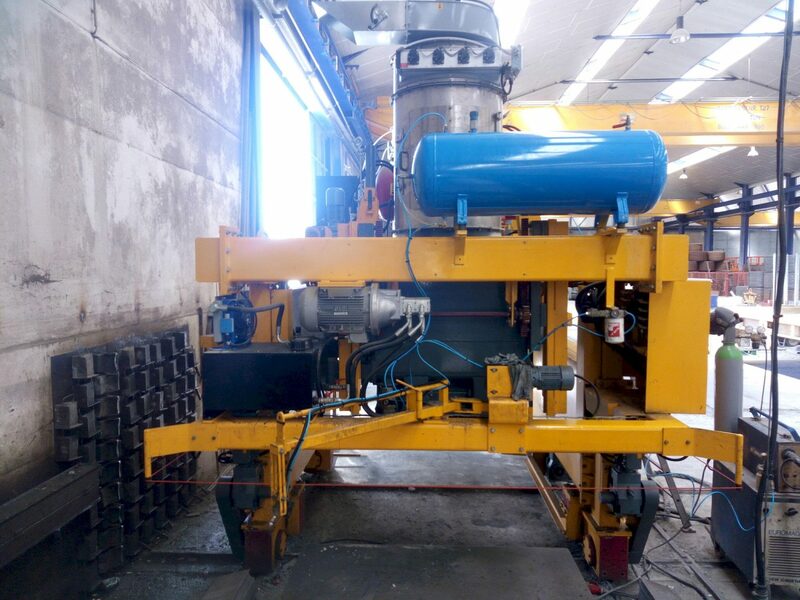 External vibrators provide additional compacting according to the concrete layer thickness. 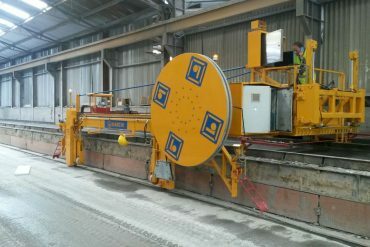 After a short period for initial hardening, a power trowel is used to finish the concrete surface. 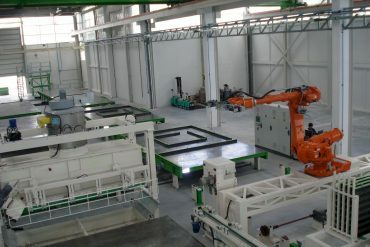 Shutter Robot for automatic placing and fixing of clean shutters and for picking up of dirty shutters. 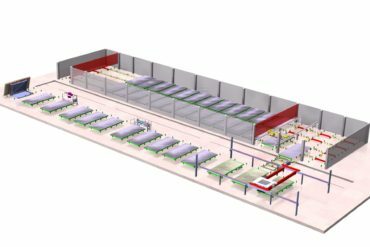 Required shutters are transferred from the shutter storage on the basis of datas passed by the Automation Control System of the plant. 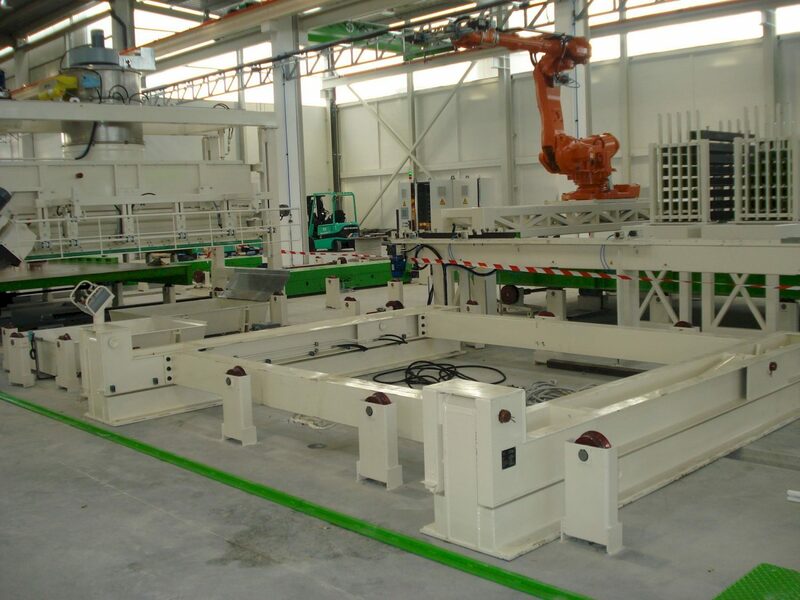 The shuttering robot places shutterings on the pallet surface and activates the integrated magnets on the shutters. 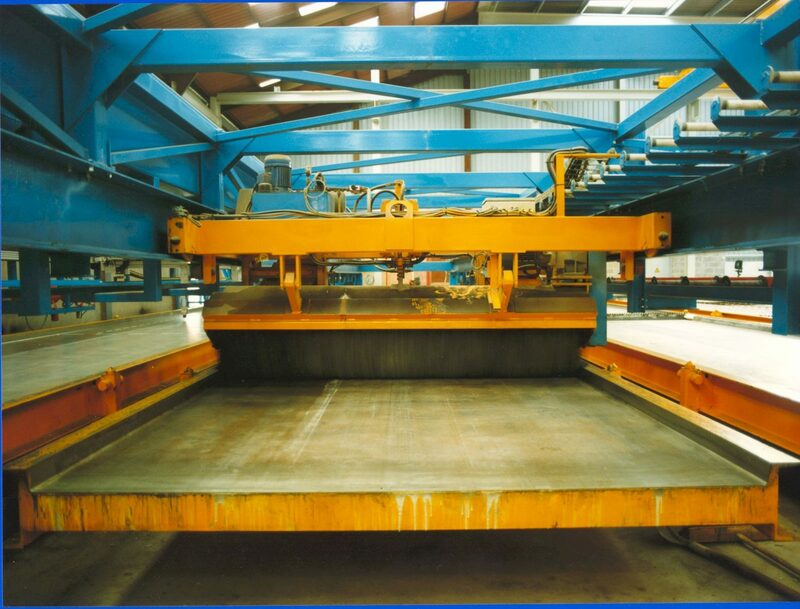 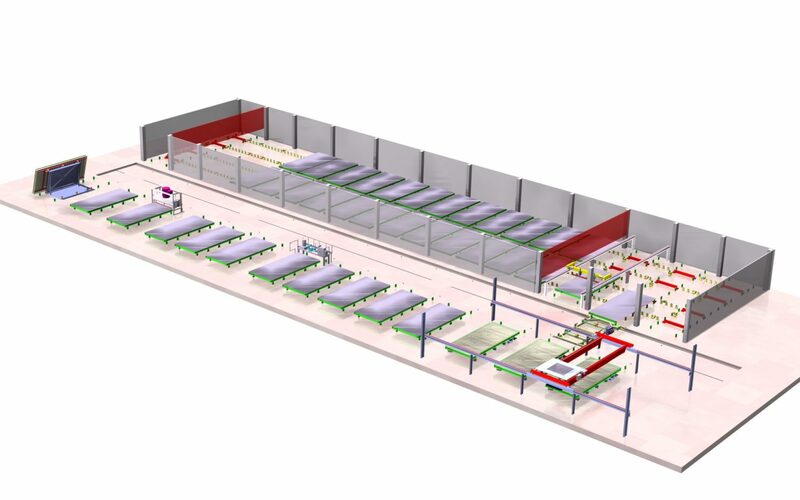 Once demoulded the panels, the de-shuttering robot removes the shutters after having identified them and transfer them to a system for cleaning and oiling. 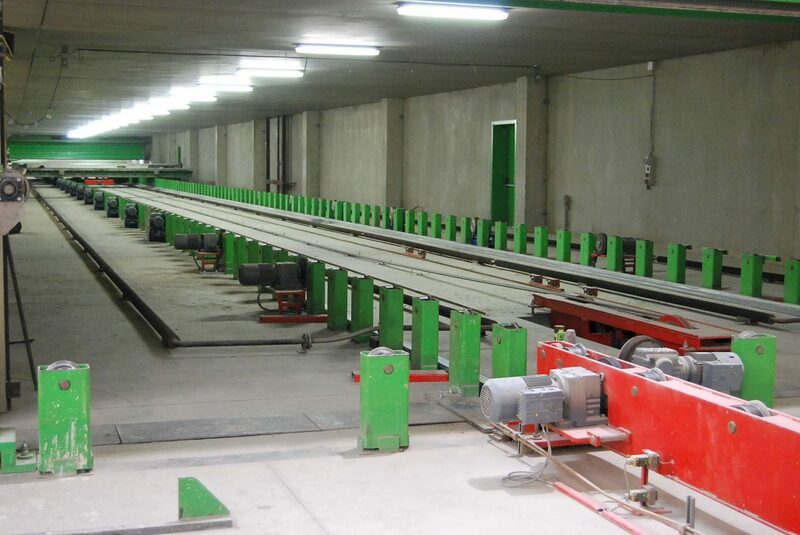 Finally shutters are placed back into the shutter storage. 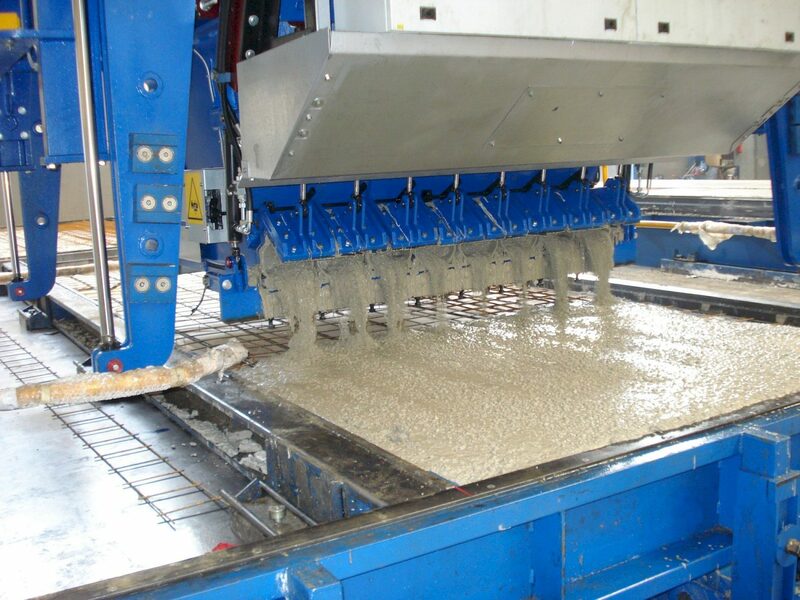 Plotter, device that marks out the product contours generated from CAD data on the pallet surface full size using water-soluble paint. 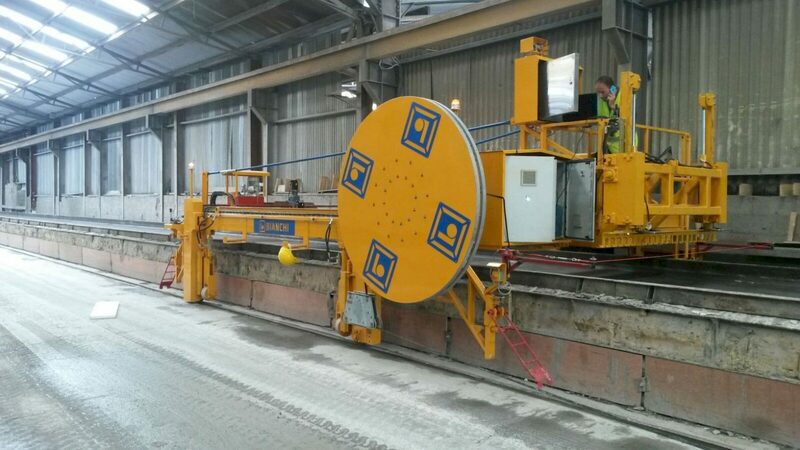 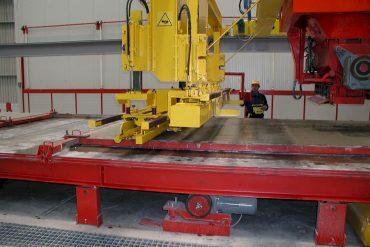 Pallet turner for double slab production. 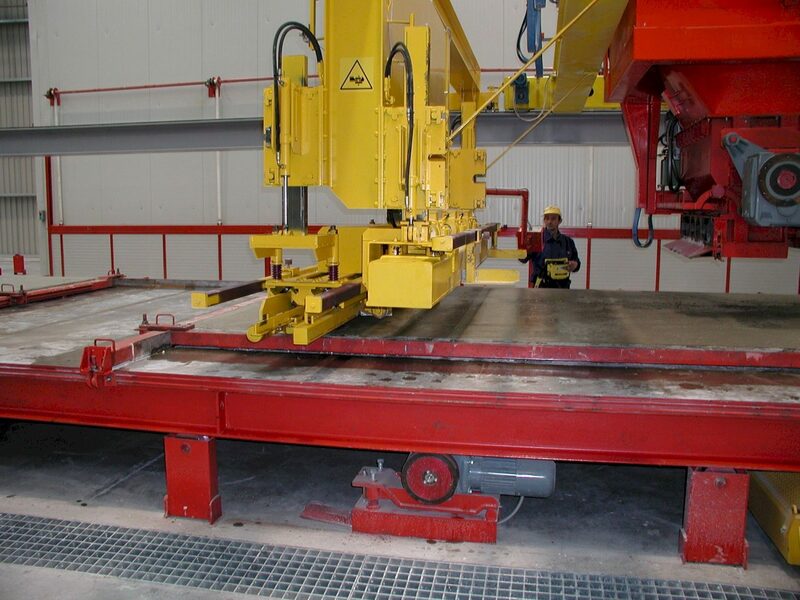 The cured first half-slab must be turned by 180° and placed down on the freshly poured second half-slab. 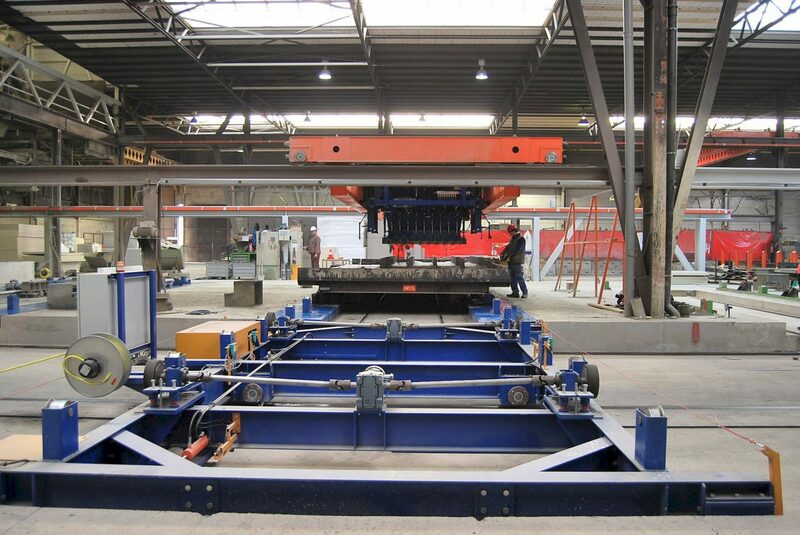 For this purpose, a turning equipment is used that turns the entire pallet including the concrete element. 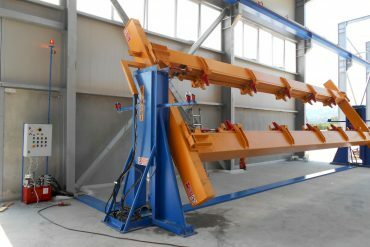 Pallet stacker. 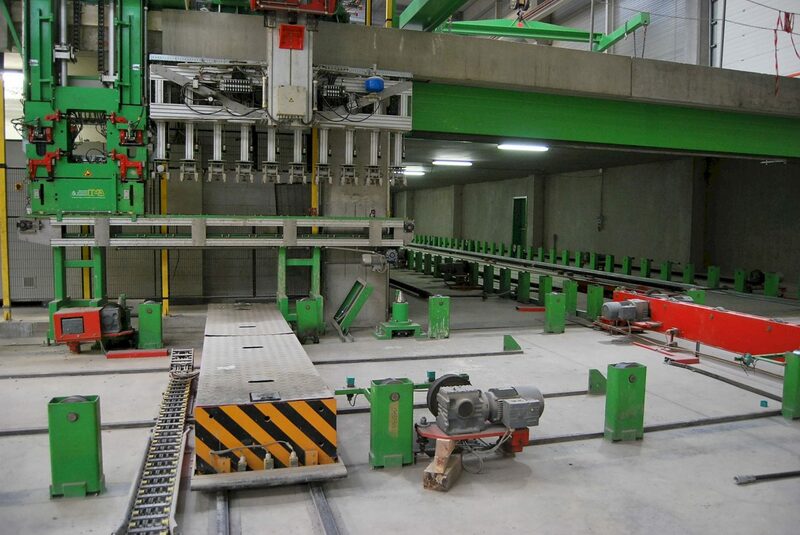 Production pallets with fresh concrete elements are stacked in a rack system for curing. The stacker lifts the pallets onto the required rack level and moves them in and out again, according to a logic ruled by the 2nd level control software of the plant. 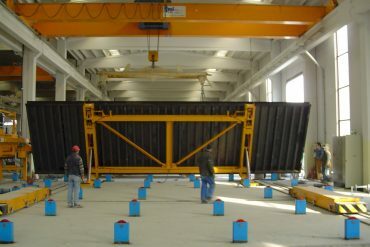 The rack systems can be provided with an optional thermic insulation panels and heating device. 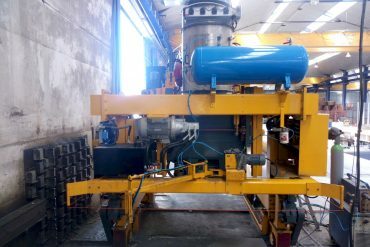 Central Shifter. 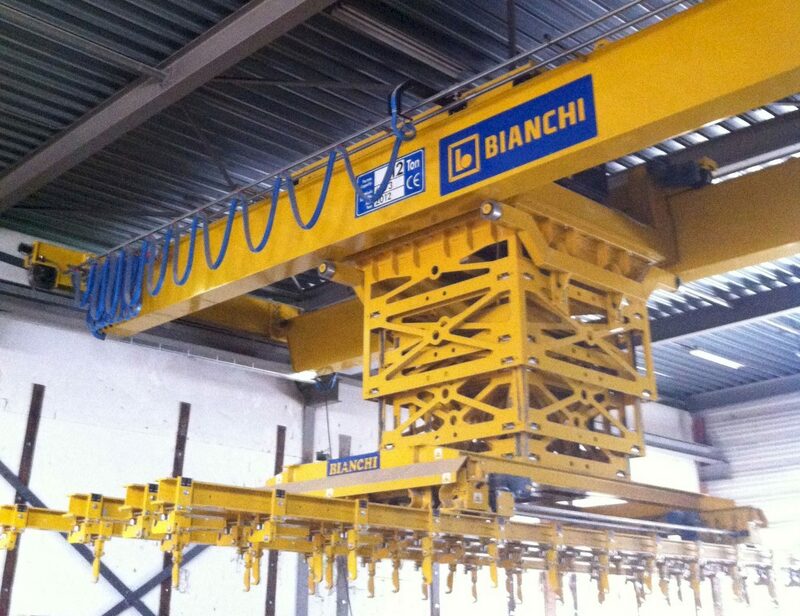 Used in production plants that require high flexibility. 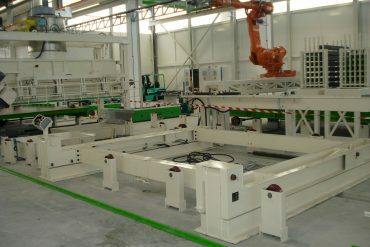 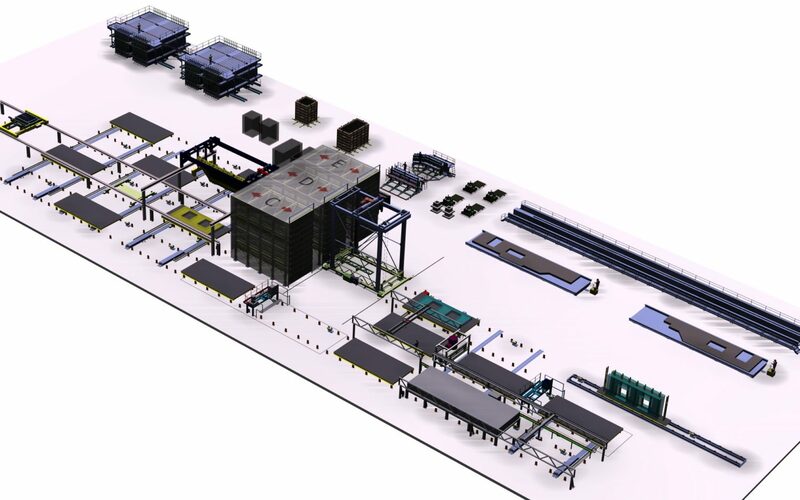 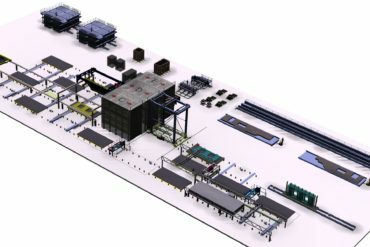 It serves as a central transport unit for the production pallets and operates the individual cycle-free workstations. 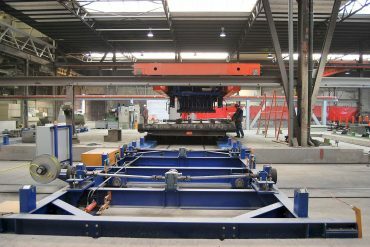 A carrousel conceived in this way has high flexibility and adaptability to different requirements. 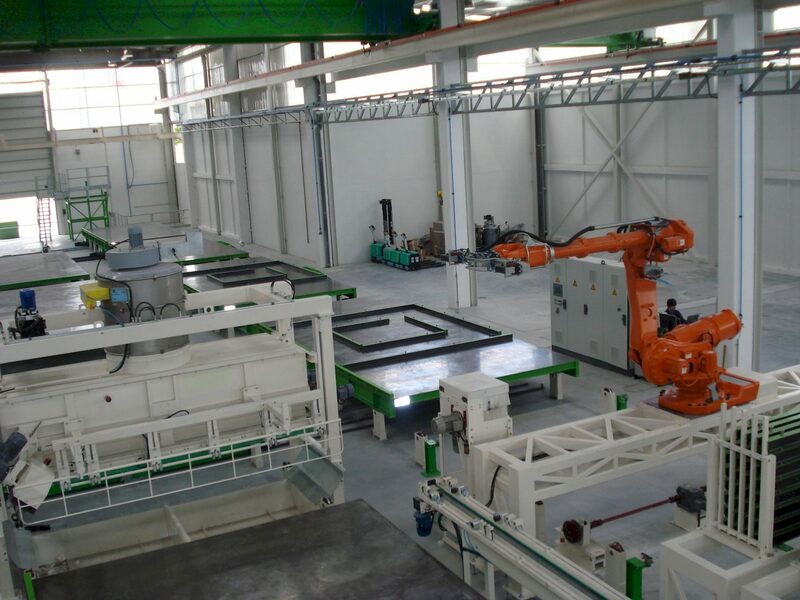 Various production steps with different cycle times can be realized. 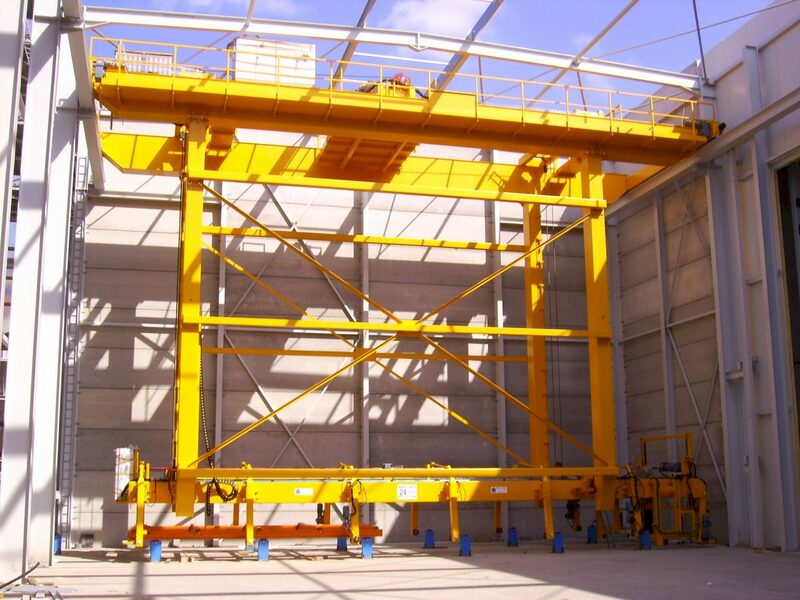 Optional lift to stack and de-stack the pallet into a rack can be added. 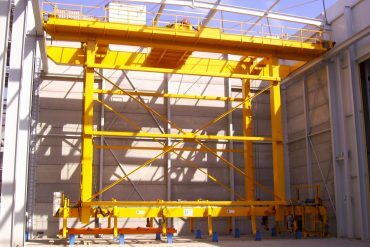 Demoulding Crane. 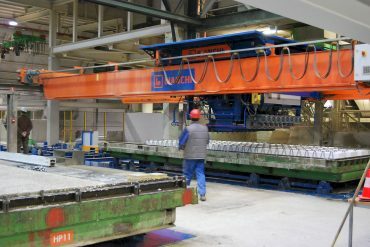 Finished products are removed from the production pallet using the demoulding crane. 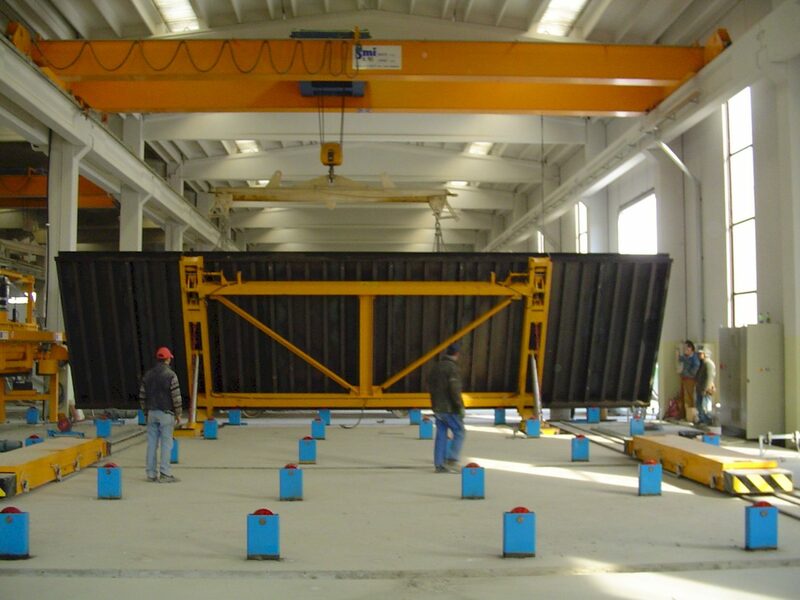 Removal can be effected either horizontally or vertically.